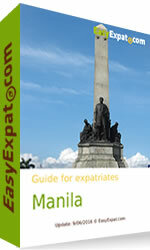 We are proud to launch our new city guide for expatriates in Manila, Philippines. The Philippines, Pearl of the Orient Seas, is known for its white sand beaches and hospitable people. The country is only a few hours away by plane to Taiwan and Hong Kong in the north, Indonesia in the south, Malaysia and Singapore in the southwest, and Cambodia and Vietnam in the west. The economy of the Philippines is the 35th largest in the world according to the October 2015 World Economic Outlook Database of the International Monetary Fund. The Philippine economy is an emerging market and is the 6th largest in emerging markets and developing economies in Asia. The Gross Domestic Product (GDP) of the Philippines is over 299 million USD. Manila ranks 1st overall, 3rd in terms of economic dynamism and 5th in terms of economy size according to an annual ranking of Philippine cities and municipalities. The city is a major center for trade and finance. It serves as the headquarters for financial institutions, private commercial banks and private insurance companies. The Port of Manila serves as the Philippines' gateway for imports and exports and one of the top five major maritime terminal operators in the world. The Manila of present day is a top tourist and shopping destination in the Philippines. The city was ranked 11th in the Globe Shopper Index and is best in terms of affordability. You can also discuss and share experience about Philippines in our forum.